It’s only January 6th, and we’re already seeing the first of many WordPress Updates to come in 2016. The latest WordPress Updates; Version 4.4.1, addressed some security issues and fixed over 50 bugs in the platform. Although, not every WordPress update that is released is considered a critical update that should be addressed immediately, the Back2Basics’ Website Security Service Team recommends staying on top of updates regularly to avoid a breakdown in code and compatibility. When versions are left alone too long it opens your site to challenges such as security vulnerabilities or the lesser, but equally frustrating, form and functionality challenges. In this particular update version, the WordPress team is strongly encouraging all website owners, managers, and full-service WordPress Hosting vendors, to update the sites as soon as possible. The latest version addresses a security release affecting all previous versions inflicted by a cross-site scripting vulnerability that could lead to your site being compromised in the near future. 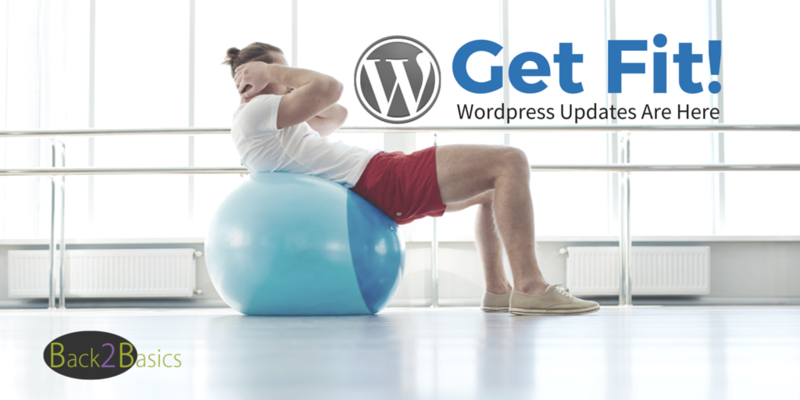 This version of WordPress updates also addressed a number of non-security bug fixes that could have an effect on performance, design or functionality. You can read more about the latest updates here: https://wordpress.org/news/2016/01/wordpress-4-4-1-security-and-maintenance-release/. For those who are not working with a Full-Service WordPress Specific Hosting Vendor, make sure your website managers are aware of the recommended updates and have systems in place to protect your website’s security and performance. Not all hosting companies/vendors are made equal. Just because they host your WordPress website files, doesn’t mean they review and manage needed WordPress updates, plugin updates, 3rd party integration, or design code. Make sure you have an advocate in your corner helping you to monitor and manage all of this to keep you site running proficiently. If you’ve recently moved your website hosting, are in between website managers, or are looking for a helping hand when it comes to your WordPress website hosting or maintenance needs, contact Back2Basics today for options. A mother and business woman with a strong entrepreneurial drive, and a need to want to see others succeed. Tanya is a wife and mother to three, an active volunteer in her community and avid lover of food, friends, travel and pushing the envelope professionally. Get a FREE Copy of Our Weekly B2B eNews! Back2Basics does an amazing job not only with communication but also with RESULTS!! I couldn't be happier and I appreciate their professionalism. Thank you for the kind words Lisa. Results always vary from circumstance to circumstance, but when I can help someone alleviate some workload or reach a new goal, it's always a good day. Thanks again! The team at Back2Basics has helped our non-profit organization stay up to date with web and social media platforms. Back2Basics is just awesome! The owner is one of the most creative digital marketing people I know. Her ability to clean up and optimize my content ideas saves me hours of work and has helped bring new attention to my bookkeeping business online. Back2Basics provides very personal attention and customized solutions. We needed someone who could help us with a website redesign and then help us optimize the information on the site for a better search results page presence. Back2Basics delivered for JG Hause Construction! And, they continue to help with monthly maintenance of the site and coaching to our internal staff on best practices for content creation and marketing strategies. Back2Basics is your local marketing solution for small business owners and non-profit managers. Solutions can include local SEO, website design and optimization, social media management, brand development and brand management, content development and distribution strategies, and more. And, all solutions are designed around the individual business, their goals, and their thresholds. This empowers the business to move forward in a strategic direction and logical rate of growth.